Unconditional Love Animal Rescue and Placement prides itself in its focus on special needs rescues. What does this term mean? 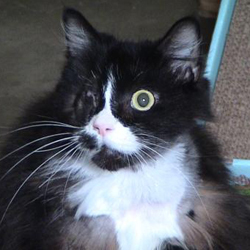 Mismee, a long-haired gray and white kitty who was tortured. Someone jammed a fishhook through her jaw (fishing line attached), tied the line to one side of a fence and tossed her over the top. Mismee dangled for an unknown time period until a passerby saw her and frantically called Animal Control. Lullaby, a siamese mix kitten who was born with a severe case of eyelid aegenesis (eyelashes that grow into the eye socket instead of away from it) and malformed eyes. 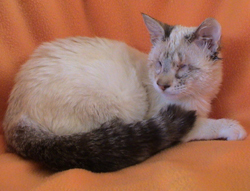 Lullaby needed surgery to repair her eye damage so she could live a pain-free life as a blind kitty. She also needed a safe and loving atmosphere in which she could recover and adjust to her environment. WE SAID "YES" TO LULLABY!! Lullaby now has her own mama and daddy AND a kitty sibling! And she is doing fabulously! Rachel Sarah, a long-haired black and white kitty, was trying to get warm under the hood of a car when a person started the engine. The resulting damage to Rachel Sarah's face was astounding: she had a crushed jaw and a damaged eye socket. Rachel Sarah needed extensive surgeries, recovery time and a feeding tube for a time, so that she could receive nourishment. WE SAID "YES" TO RACHEL SARAH!! And now Rachel Sarah is home with a wonderful dad and daughter team! Ochie, an adult tortie kitty, who was turned into the shelter with a horrible infection that her people could not afford to treat. By the time we brought Ochie into our organization, she needed multiple surgeries which resulted not only in the loss of an eye, but a portion of her cheekbone as well. Ochie's entire mouth then became infected, so she lost most of her teeth in a series of other surgeries. It took over a year to bring Ochie back to complete health. WE SAID "YES" TO OCHIE! And after over a year with our organization, Ochie just went home with people who love her just the way she is. These are just a few of the special needs animals that Unconditional Love has excitedly rescued from local shelters. We have several special needs babies under our care right now who need your support in order to have the lives they were meant to have! Please click on the Sponsor Me link below to sponsor a special needs animal!! View our current special needs babies on PetFinder! Special needs animals have a sweet little green heart by their names!! You can also may indicate which animal you would like to sponsor as part of the PayPal donation process! We and the special needs babies of Unconditional Love thank you for your support! !